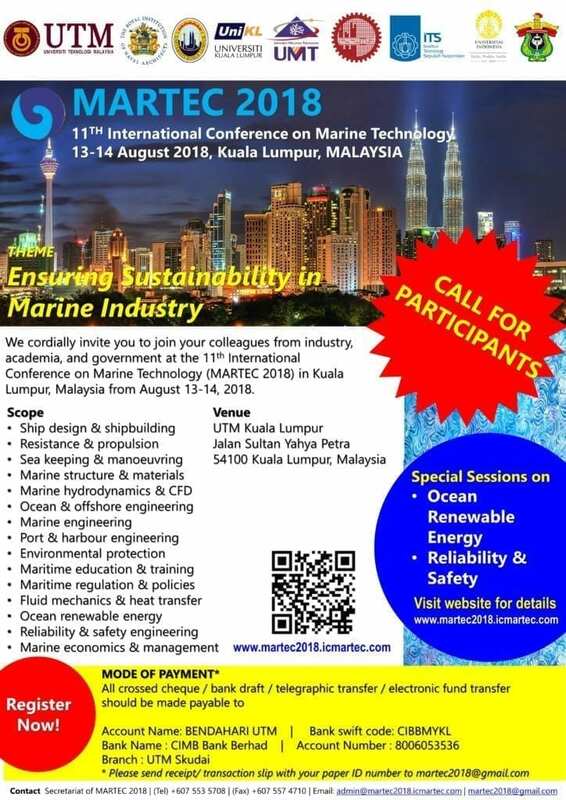 On behalf of the Organizing Committee, we would like to invite you to the 11th International Conference on Marine Technology (MARTEC 2018) which will take place on 13th to 14th August 2018 at Universiti Teknologi Malaysia Kuala Lumpur Campus, Kuala Lumpur. 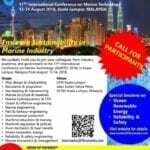 The conference is organized by Department of Aeronautics, Automotive & Ocean, Faculty of Mechanical Engineering, Universiti Teknologi Malaysia and Marine Technology Centre, Universiti Teknologi Malaysia. This conference is targeted for encouraging better cooperation between academic institutions and industries, strengthening regional and international networking and providing a forum for sharing knowledge among regional and international researchers in the field of marine technology. forward for a favourable response from you. Event categories: Conference and Kuala Lumpur.